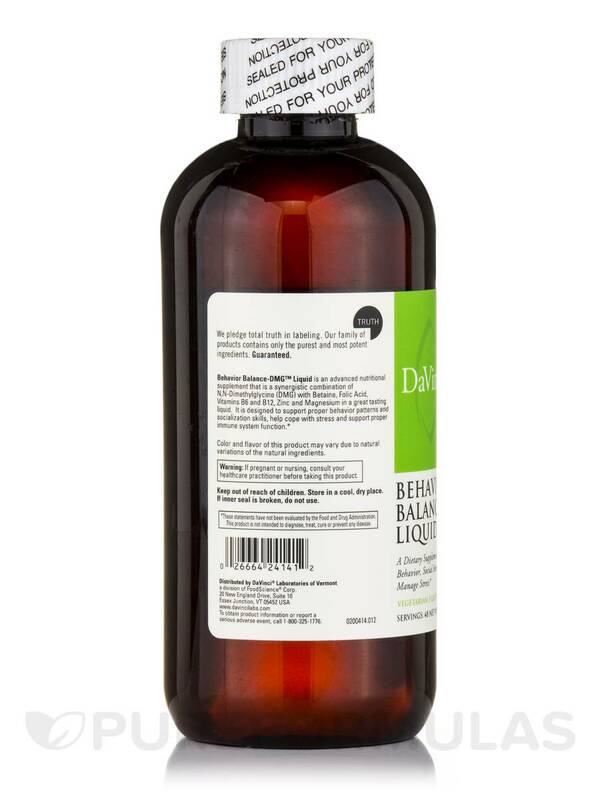 My son has Autism and has been switched to Behavior Balance DMG Liquid by DaVinci Labs in place of Methyl B12 shots. Since we use 2 + bottles a month PureFormulas saves us a lot every month! Zinc—a mineral that provides an immune system boost‚ while also promoting eye and mental health. 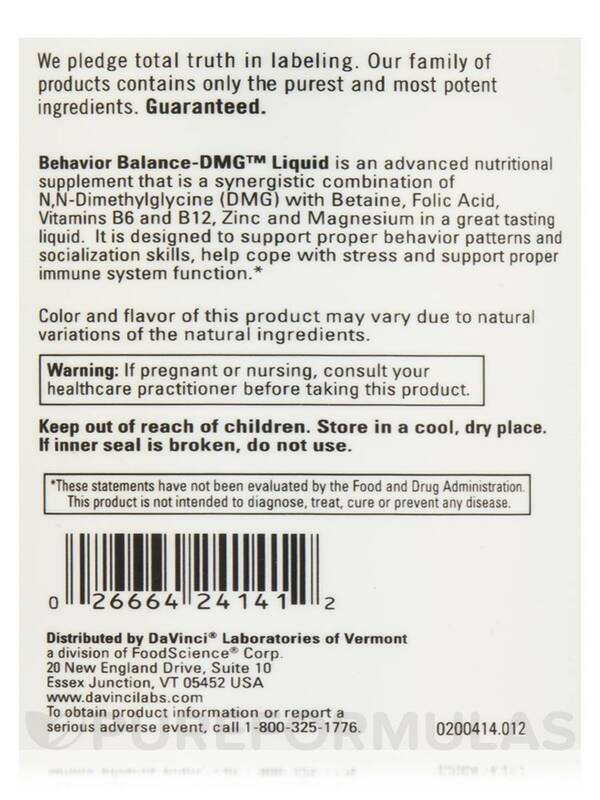 Behavior Balance-DMG LiquidTM is available in a 12-ounce bottle. How long the supply lasts will depend on the dosage that you take. The recommended dosage for children under the age of six is ½ tbsp daily. For children between the ages of six and 12‚ the dosage is ½ tbsp. twice a day; for kids over the age of 12 and adults‚ the dosage is ½ tbsp‚ three to four times daily. This product should be shaken well before it is used. DaVinci Laboratories has been a leader in nutritional research and product development for decades. They are dedicated to providing products with superior manufacturing quality and natural ingredients. DaVinci also supports extensive research into the effectiveness of nutrients‚ allowing it to formulate unique supplements. Other Ingredients: Glycerin‚ purified water‚ natural tropical punch flavor‚ potassium sorbate‚ n‚n-dimethylglycine hydrochloride‚ malic acid‚ vegetable gum. Vegetarian / Gluten-Free / Soy-Free / Non-GMO. 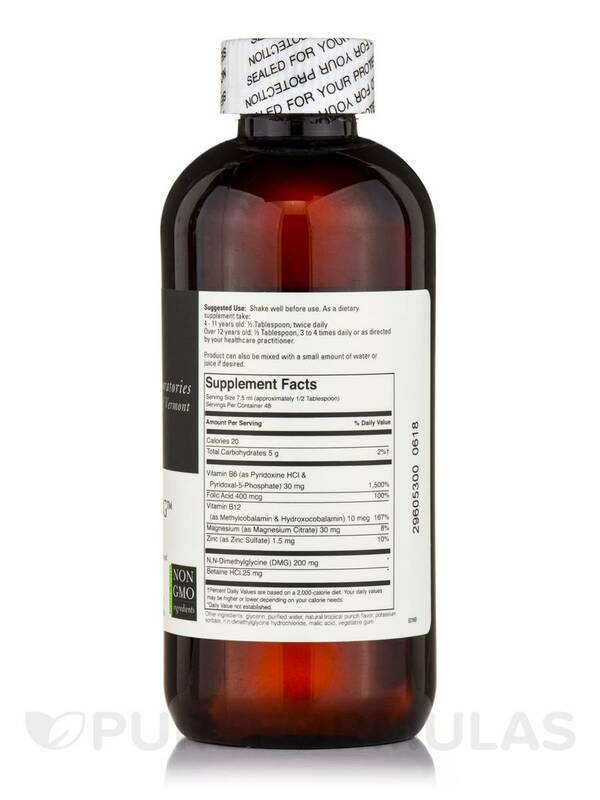 4-11 Years Old: 1/2 Tablespoon‚ twice daily. 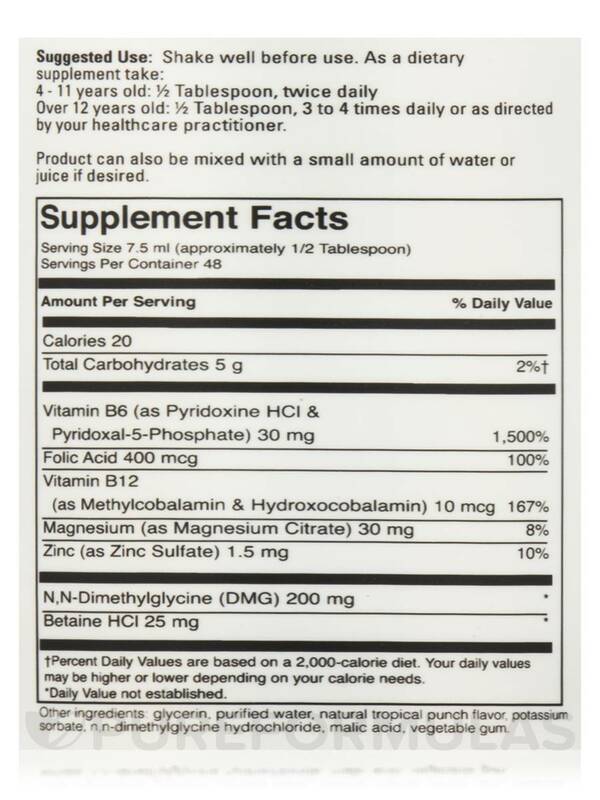 Over 12 years old: 1/2 Tablespoon‚ 3 to 4 times daily or as directed by your healthcare practitioner. Product may be mixed with a small amount of water or juice if desired. Notice: Color and flavor of this product may vary due to natural variations of the natural ingredients. Seems to help my son stay focused and complete his school work. He still has good days and bad days. 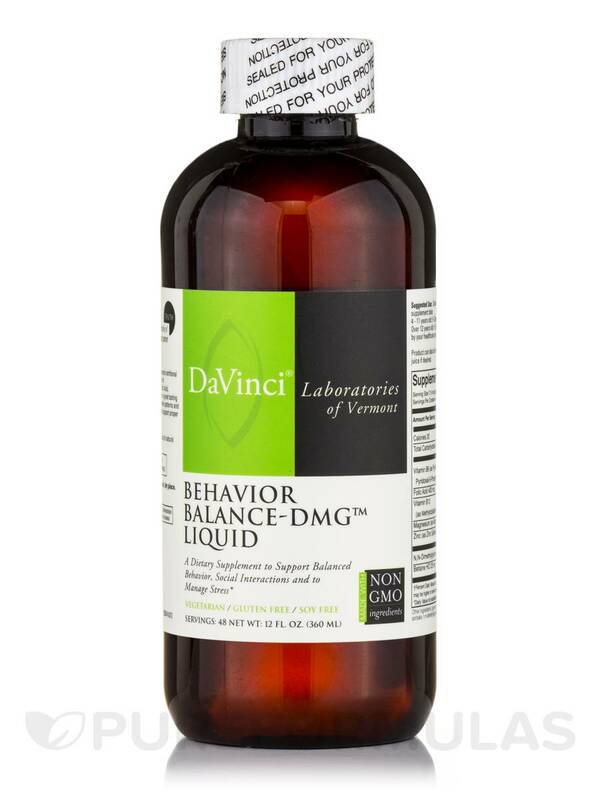 I would recommend trying Behavior Balance-DMG Liquid by DaVinci Labs. Convenient to order, free shipping, no side effects. Our son has had very many outbursts and not able to reason... I could tell he would get VERY frustrated and knew he needed help. We took him to our doctor and she prescribed ADHD meds. He was very docile and dopey... But she didn't want him on 24/7. When he was off in evenings he was 10 times worse... A visit to our alternative medicine doctor and he recommended Behavior Balance-DMG Liquid by DaVinci Labs. I stand in awe. It has changed his life... When I have not given it to him, you can tell by the second day he is not Reasonable again... This stuff really WORKS!!!!! This is a natural product to help heal the brain not just replace seritonin. I am here ordering a 3rd bottle of Behavior Balance. I am using this with my 5 year old who is some where on the Asperger spectrum. If I give him a dose at bedtime and a dose in the morning without fail then he seems to be in better control of his "outbursts" and getting in others "space". He is also better at going to bed without a fight. We just ran out 3 days ago and this morning he has been screaming and fighting with everyone. So I do think Behavior Balance is helping him some. Will this brand of DMG help with speech delay and tactile defensiveness? What about the side effect I read about of hyperactivity? What is a good dose to start with for a 30 lb. 3 year old girl? Thanks. Hey there Noel, thank you for choosing Pureformulas.com, this is a nutritional supplement that provides support for neurological health‚ without negative side effects. Children may especially benefit‚ because that balance can work in combination with other factors to help them develop good social skills and behaviors that are essential to everyday life. Please speak with your healthcare practitioner to know if this product is right for your daughter and an accurate and safe answer for the amount of dosage for her.